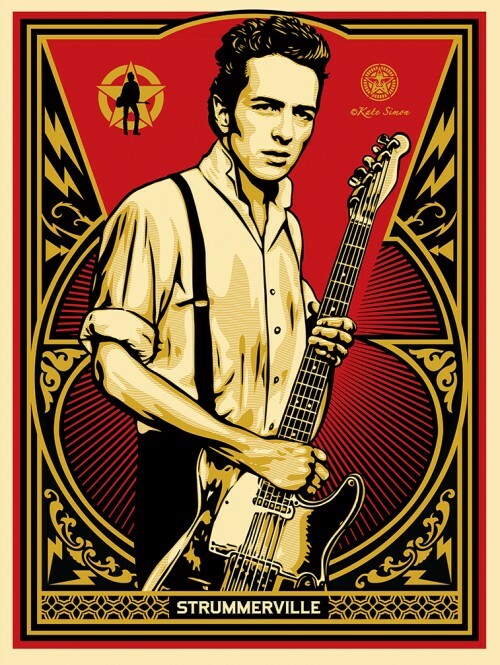 This Tuesday, Shepard Fairey is set to release "Strummerville" based upon Clash front man Joe Strummer. The print was made to draw attention to, and raise money for, the Strummerville charity. "The Clash are my all-time favorite band and their frontman, Joe Strummer, is a hero of mine for his music, lyrics, wit, compassion for the underdog, and stance against injustice. Joe’s widow Lucinda approached me about creating an image of Joe to help raise funds for Strummerville, the charity set up to honor and fulfill Joe’s belief that music can inspire and empower. Strummerville provides opportunities for musicians around the globe. I was incredibly honored that Lucinda asked me to be involved, and I was moved when she shared her opinion that Joe and I have similar philosophies. The print is a collaboration with photographer Kate Simon, who shot the first Clash cover. Please check out what Strummerville is about and show your support! Thanks for caring." Drop Details: The print will be released at a random time at 1 PM EST at Obeygiant. It measures 18x24 and has an edition of 450. It will be signed and numbered and cost $65. Good luck!